Nine activists from the Hambach Forest occupation are in pre-trial detention, accused of obstructing the work of police officers. They were arrested during the barricade evictions on January 22. 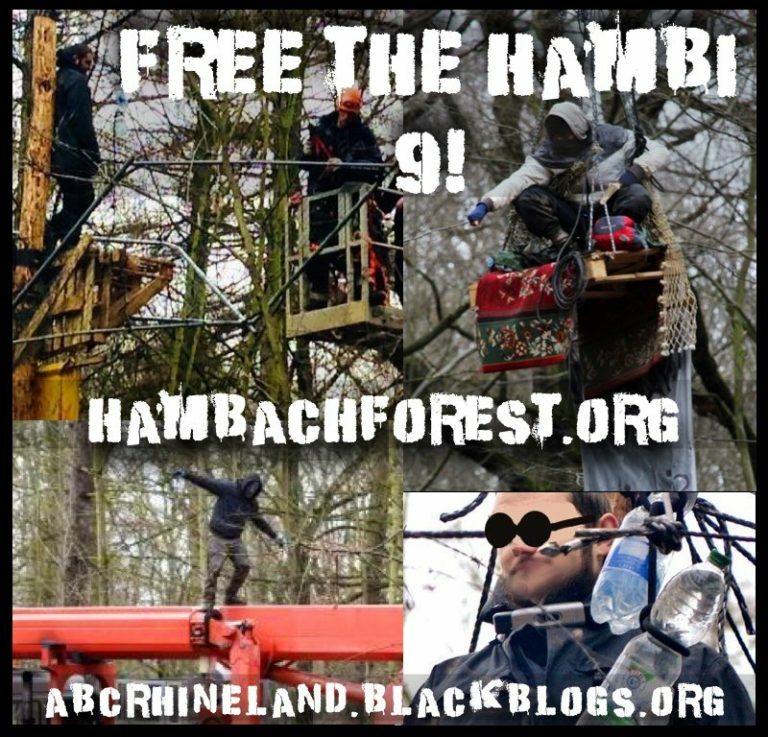 Nine activists from the Hambach Forest (between Cologne and Aachen, Germany) occupation are in pre-trial detention, accused of obstructing the work of police officers. They were arrested during the barricade evictions on January 22. Arriving early in the morning on January 22, the cops had to face activists occupying blockading-infrastructure, including 2 tripods, 3 monopods, a skypod, and a 3 meter deep tunnel. The cops arrested several people, nine of them, the “Hambi 9”, are still in pre-trial detention. The cutting of the Hambacher Forest was officially stopped early this season, on a court-decision, postponing cutting until October 1st 2018, however the risk of eviction of the occupation is as great as ever. The “Hambi 9” would love to get mail! Exact information, including adresses and languages, can be found on the blog of ABC Rhineland.